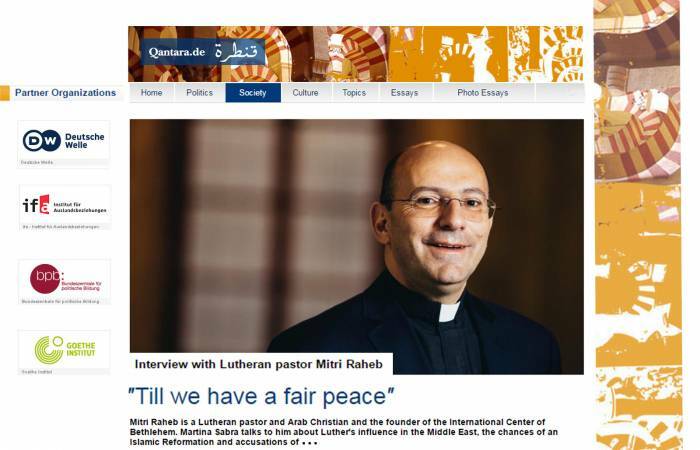 Don’t expect Dr. Mitri Raheb to paint a rosy picture of the current situation in Bethlehem. Raheb, who was born there, has lived under occupation for 50 of his 55 years. He’s long since given up convincing his fellow Christians — an ever-shrinking group in The Holy Land — to stay. In turn, Raheb continues to preach a gospel of hope, looking for — and finding — those rare silver linings in dark times. Raheb was in North Carolina last week, serving as the keynote speaker for “Dare to Dream: An Ecumenical Conference on Peace and Justice in the Middle East,” March 24-26, with events throughout the Triangle. He also spoke at Union Theological Seminary in Charlotte, and met with several supporting churches in that city. That’s also where Bright Stars of Bethlehem held its board meeting. Raheb is the organization’s president. 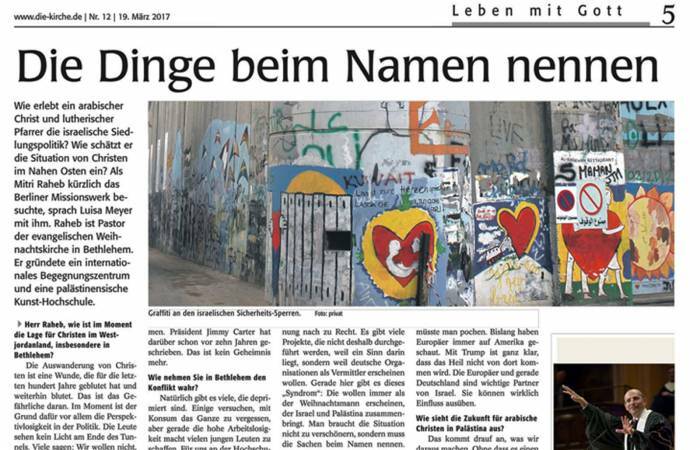 He also is president of Dar Al-Kalima University College of Arts and Culture in Bethlehem, the only college of its kind in the West Bank. And since 1988, he’s been pastor of Christmas Lutheran Church in Bethlehem, a mission partner with St. John’s Lutheran Church in Salisbury. On March 24, Bishop Tim Smith introduced Raheb as keynote speaker at White Memorial Presbyterian Church in Raleigh. It was the first time that Smith, bishop for the N.C. Synod since 2015, spent time with Raheb. “His presentation was very helpful — clear in his message of hope and not primarily critical of Israel’s policies,” Smith said later. “He simply lifted up the plight of his people, the Palestinians, and how unfairly they have recently been treated in Bethlehem. 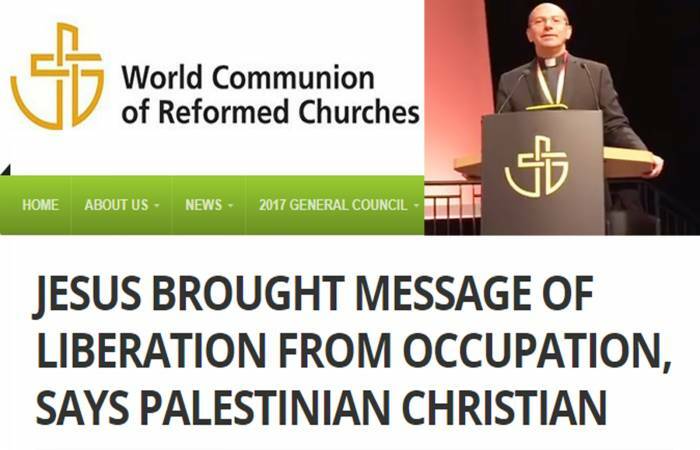 I hope the result of his visit will be that Christians here in the states will have a more balanced perspective on the complicated Israeli/Palestinian dynamics in Palestine and will be able to draw a distinction between the biblical people of faith, the Israelites (who received the promised land) and the current state of Israel. Raheb is the author of 17 books. His newest book is “The Cross in Contexts: Suffering and Redemption in Palestine.” It is available on Amazon beginning April 20. Raheb remembered giving up a high school graduation party, because a classmate had been imprisoned for protesting peacefully. He and his wife never had a wedding reception when they married in 1989. A year later, he held his three-month-old daughter as the young family faced the threat of poisonous gas attacks from Saddam Hussein. He said he always thought there would be peace in his lifetime, but now wonders if his two grown daughters will experience it. Raheb always encourages his audiences to be peacemakers, not “peace talkers.” He told the stories of three students at Dar Al-Kalima, and how their lives have been changed. On March 25, Raheb was part of an interfaith discussion at Church of the Reconciliation in Chapel Hill. Appearing with him were Sandra Korn, a representative of Jewish Voice for Peace; Faisal Khan, an American Muslim who is founder and director of the Carolina Peace Center; and the Rev. Mark Davidson, the church’s pastor. All of the speakers discussed the concept of creative resistance — again, a peaceful means of protest using the arts. “It put a human face on all of this,” said Linda Hull, a member of St. John’s who attended the event with husband Roger. Also attending were St. John’s members Michael and B.J. Connor. Connor leaves April 9 to spend three months in Israel in an ecumenical accompaniment program sponsored by the World Council of Churches. On March 26, Raheb was guest pastor at Duke Chapel in Durham. His sermon text was based on Mark 15:27-34, when Jesus was crucified between two robbers.